I watched Ingrid's and Allison's vlogs last night and they were drinking cucumber refreshers which I've never heard of before. I like to make my own drink mixes and smoothies so thought I'd give it a go. Chop/blend cucumber in blender or food processor until pulp like. Add lemonade. Strain mixture into a pitcher and add honey to taste. Serve with cucumber spear or lime wedge. 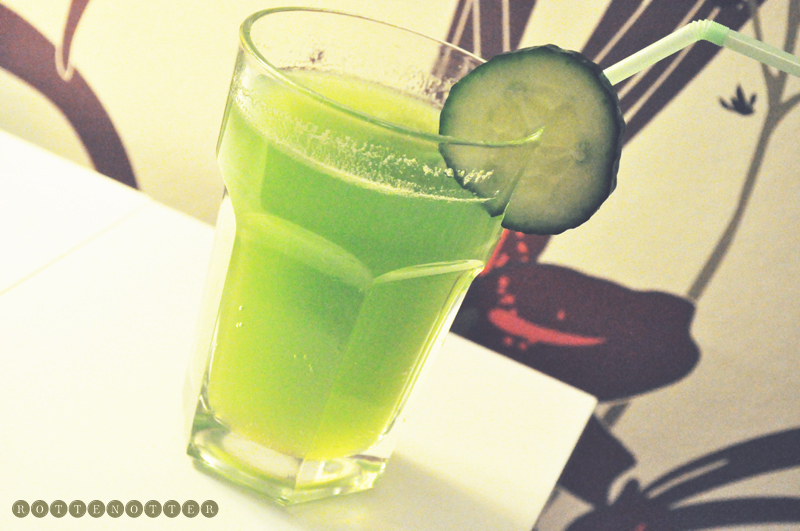 It's a pretty simple recipe, I juiced the cucumber as I thought it would be easier than blending and then straining. If you don't have a juicer though it'll still be pretty easy to make. This recipe makes 5 - 8 glasses depending on the size and if you add ice. I actually forgot to add ice but next time I make this drink I'll definitely be putting ice in. .
A perfect drink for the summer! And one I'll be making a lot.